Malaysia Airlines today announced an extensive redesign of its Golden Lounges for an exciting new pre-flight experience for guests. The new design will combine elements that are uniquely Malaysian with the modern functionality for a truly enhanced travel experience. Passengers will be able to get a first taste of the new features in late 2016, beginning with the Regional and Domestic Lounges at KL International Airport. This will be followed by the Business and First class lounges at the KLIA Satellite terminal and London Heathrow, expected to be completed by mid 2017. 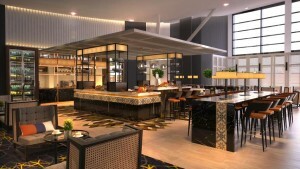 The key feature of the new Golden Lounge is a demonstration kitchen concept, allowing guests to interact with chefs, which will be a focal point for an upgraded offering of Malaysian and international gourmet specialties. Guests will have the option to indulge in a bistro service or have a quick snack on-the-go, with the additional option for a fine dining experience in the First Class Lounge. The improvements also entail an upgrade to our WiFi services to enable faster speeds along with the addition of universal power sockets for the convenience of our guests. Malaysia Airlines’ Chief Commercial Officer, Paul Simmons said, “Delivering a holistic experience for our guests which starts from the lounge lies at the heart of the redesign. We want the space to encapsulate the richness of travel with the airline, a luxurious contemporary Malaysian style that our guests will be able to experience when they enter any Malaysia Airlines Golden Lounge around the world. The new design will feature an expansive lounge where guests will find a world of amenities to help them recharge, relax or catch up with work”. “We are extremely excited about the project which marks the next phase of an exciting products and services roll-out to provide our customers with an enhanced travel experience,” concluded Paul. The Interior Design consultant behind this new look is internationally-renowned, Kuala Lumpur based firm, Duoz. Formed by twin brothers, Zaidan and Zaihan Tahir, Duoz was also responsible for the relaunch of the Majestic Kuala Lumpur, as well as other international 5-star hotels and resorts such as the Marriott Sydney Harbour (Circular Quay), Spa Village Resort Bali and Ritz-Carlton Kuala Lumpur. More information on other design projects by Duoz can be found at the following link: http://www.duoz-design.com/portfolio.html.